Tuesday, June 5th, the Board of Directors for the CT Chapter of the New England Mountain Biking association met at Brooksvale Park in Hamden and rode in the Naugatuck State Forest. Of course getting to the State Forest meant having to ride through Brooksvale Park, on the way in, which is implicitly not allowed but it seems the land manager turns a blind eye to this activity along with the equestriennes. It's ironic that Brooksvale's two biggest users groups are Horses and Bikes and it is implied that they are not included as a permissible activity. 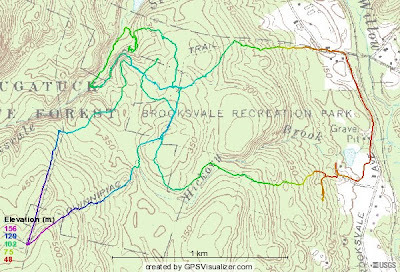 Ironically, however, when you look on the Brooksvale Website or read the trail map, there is also no mention that biking and horseback riding is not allowed but they do have 7 miles of hiking trails. Does one imply that only hiking is allowed on a hiking trail? Anyway, we were a small group, totaling five riders, two FS rigs and the other three on single speeds. In fact, I think this was the largest assembly of single speeders that I have ridden with since making the conversion! The climb to the State Forest, for the most part, was attainable. Being a weaker rider, in comparison to the other two single speeders who train for this kind of stuff, I only had to walk one or two spots. The other two were animals! Once in the forest, it was almost surreal. First of all, the state has been doing quite a bit of logging there so it nearly resembled a war zone but the trails were still there and they were sweet! We hit almost every trail and it was a great ride, especially for single speeding.